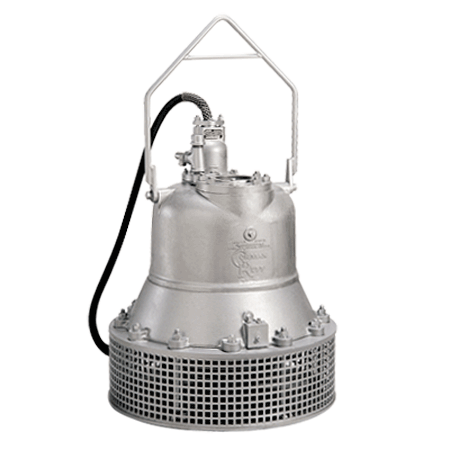 Gorman-Rupp Wode Base Submersibles are designed for applications where high volume and high head are required, and large solids are not a problem. Pumps have only two moving parts and three wearing surfaces so maintenance and repairs are minimal. Abrasion-resistant ductile iron and manganese bronze impellers stand up to sand, gravel and other abrasive materials. The fully shrouded impeller back reduces seal pressure and helps prevent foreign material from entering the seal cavity. Seal life is extended and operational life of the pump is increased. Optional impellers of CD4mCu are available for corrosive/abrasive applications. Rotor shaft and all internal nuts and bolts coming in contact with the liquid are made of stainless steel to resist corrosion and pitting and extend the operational life of the pump. For severely corrosive/abrasive applications, stainless steel lifted pump models of CD4MCu are available.